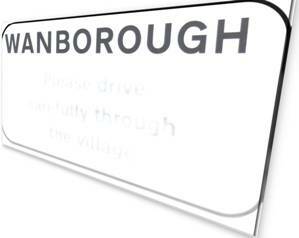 Overview of History of Wanborough. 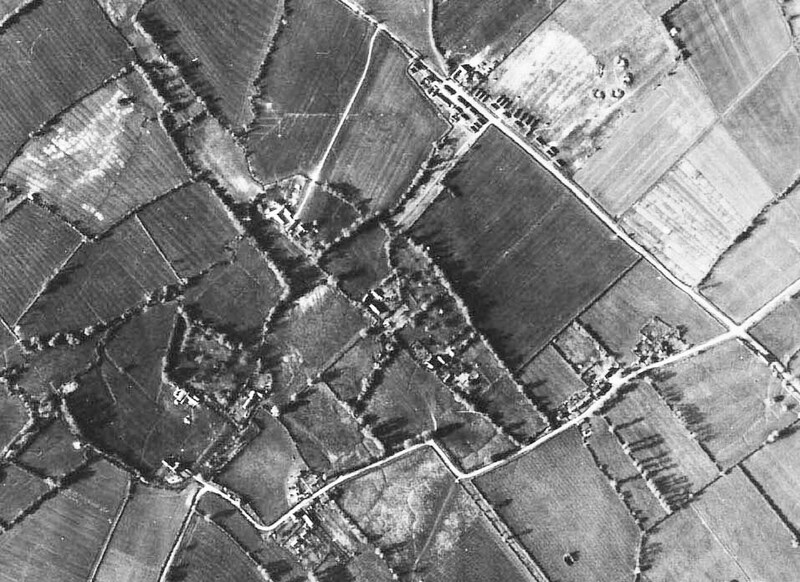 There is also evidence of occupation in Wanborough in the following Bronze Age in the form of four ploughed out round barrows in the field behind the former Shepherd's Rest identified from aerial photographs and by geophysical survey. 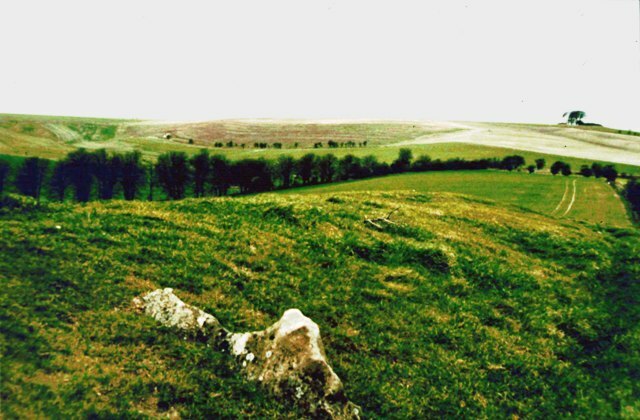 The Ridgeway which crosses the parish was probably first used in the Bronze Age and the following Iron Age, when Liddington Castle and other hillforts on the Ridgeway were built. It is from these round barrows that Wanborough gets its name from the Anglo-Saxon WAN and BEORGH both of which mean burial mound. Between the Bronze Age people building the burial mounds and the Saxons naming the area after them, the Romans came, saw and conquered, and eventually left! There is plenty of evidence in the parish from the 400 years they were here. Ermine Street, the Roman road linking the two provincial capitals of Silchester and Cirencester, runs through the parish along the High Street. Another Roman road from the south coast running via Winchester and Mildenhall, near Marlborough joins Ermine Street at Lotmead and it is here that a Roman town was built. The Roman town has been known of since at least 1690 when John Aubrey wrote of finding a hoard of over 2000 Roman coins, and in the early 1800s Richard Colt-Hoare erroneously named the town NIDUM, which appears on some early OS maps. A.D. Passmore who lived in the village suggested it could be Durocornovium a town between Silchester and Gloucester listed in the Antonine Itinery - a sort of road atlas containing the major routes across the whole Roman Empire. 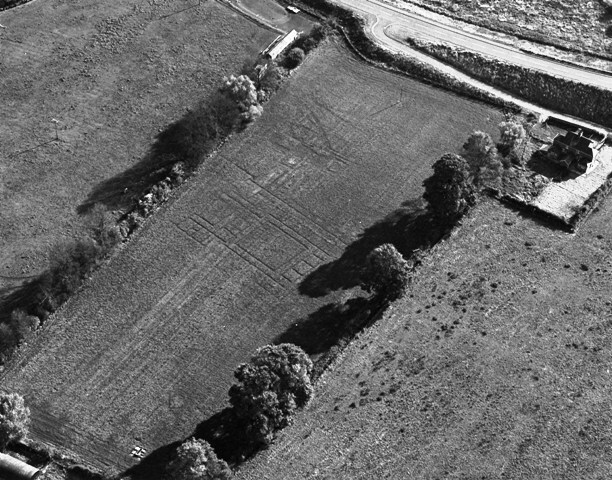 A large part of the town was excavated in advance of its destruction when the A419 Stratton By-pass was built in the 1970s, and in the particularly dry summer of 1976 crop marks revealed the site of a substantial building at Lotmead. 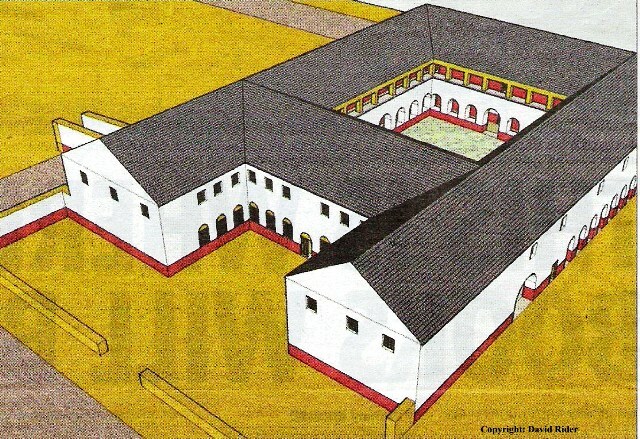 This building, although never excavated or even surveyed using geophysics, has been identified as a mansio, a sort of travel lodge for use by officials on imperial business where they could rest overnight and obtain fresh horses. This area has been scheduled by English Heritage to preserve it, but the Roman remains extend well beyond the scheduled area and are under threat from proposed developments. There were other Roman buildings in the south of the parish and a possible shrine to a water deity on Callas Hill above a Roman villa site to the east of the High Street. When the Roman legions left in about 410 AD the Saxons came. They haven't left much physical evidence such as building foundations, just a few burials, but they have left their mark on the parish in its name and its boundaries. A Saxon land charter drawn up in 1043 granting lands to the Bishop of Winchester describes the boundaries of Wanborough and Little Hinton. The Bishop still held Wanborough at the time of Domesday, but Earlscourt was by then a separate manor. 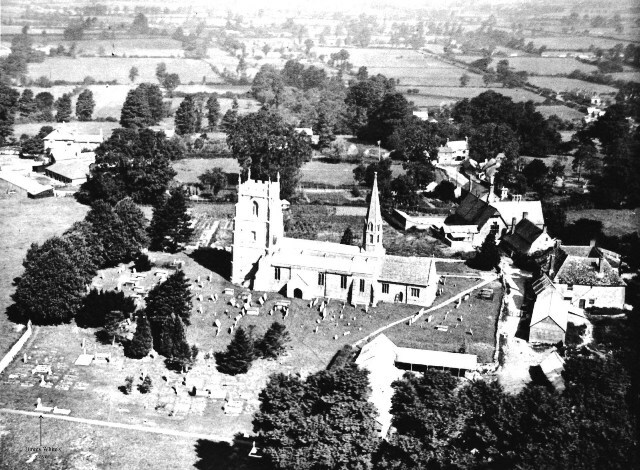 It was absorbed back into Wanborough in the middle ages and then became part of Hinton parish in 1884. Covingham was split off from Wanborough in 1982. Norman kings rewarded their supporters after the 1066 conquest with grants of land which had previously been held by the defeated Saxons. 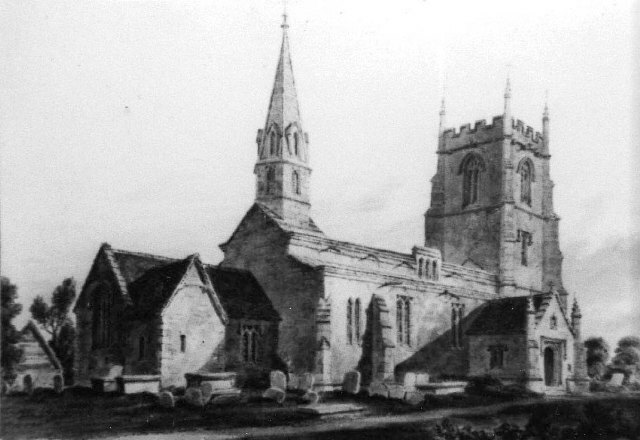 By 1250 Wanborough was held by Stephen Longspee a nephew of the Earl Salisbury. 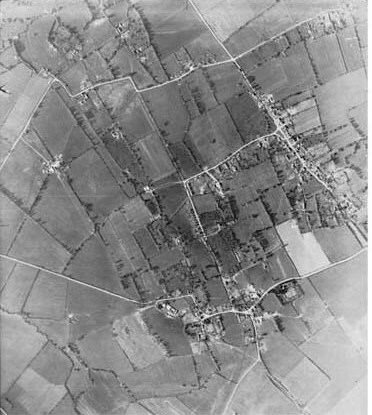 His manor was built within a moated site on Wanborough Marsh and the outline of the moat can be seen plainly on this aerial photo taken in 1946. Stephen Longspee died in 1260 and his widow Emily, Countess of Ulster by a previous marriage, built a chantry chapel dedicated to St Katherine within her manor court. She endowed it with an estate of 60 acres, the income from which paid for three priests to say prayers in the chapel for the soul Stephen. 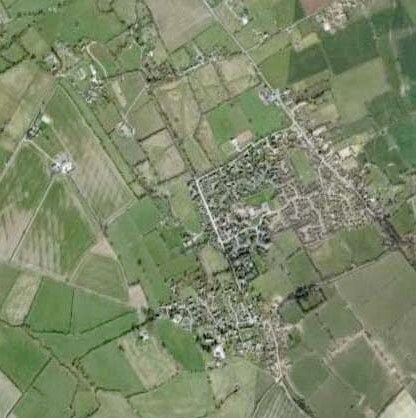 The senior of these priests was called the Warden and the estate the Wardenage which became shortened to Warneage. After Emily's death the manor of Wanborough and the Warneage estate passed by marriage to the Lovell family. Francis Lovell, a minister of Richard III, sold the Warneage estate with the chapel to Bishop Wayneflete of Winchester in 1483, who gave it to Magdalen College, Oxford in the same year. Magdalen College kept all of the old deeds relating to the estate which is why we now know so much about it. Francis Lovell lost all, including his life, after Richard was defeated at the Battle of Bosworth by Henry Tudor who gave the main manor of Wanborough to the Darells of Littlecote. It was sold on over the centuries until the last lord of the manor was Ambrose Goddard of Swindon. Earlscourt was another of Wanborough's medieval sites. When St Katherine's chapel was pulled down in 1549 at the time of the dissolution of minor religious houses by Edward VI, Magdalen College sold the stone to Thomas Hinton of Earlscourt so some may be incorporated in that building. Wanborough's other medieval house was Hall Place, the home of the Polton family, who were the main contributors to the building of the St Andrew's church tower in 1435. Hall Place, to the east of the High Street behind Ambrose Cottages was probably built over the site of the Roman villa mentioned above. The last mention of Hall Place is in the parish register for 1635 when the widow Brind died there. 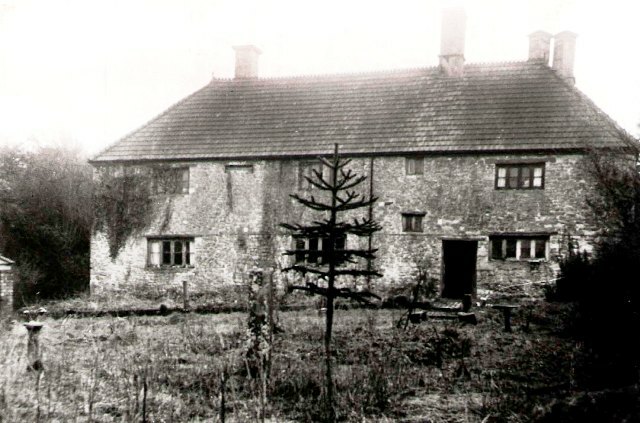 Callas House to the west of High Street was built in the 1600s and belonged to the family of Sir Thomas Phillips who had many of the church records and manor court rolls privately printed which provide another good source about the history of the village. The last occupant of Callas House was A D Passmore an antiquarian who excavated several of the prehistoric sites in the area, wrote many articles for the Wiltshire Archaeological Magazine and who collected many artefacts now held by the Ashmolean Museum in Oxford. He had Callas house listed but this did not prevent it from being demolished in 1960 to make way for Callas Rise. Throughout the middle ages Wanborough was farmed on the open field system, where villagers cultivated strips of land scattered among the common fields of the village, and grazed their animals on common pasture. The Beanlands was one of these common fields. 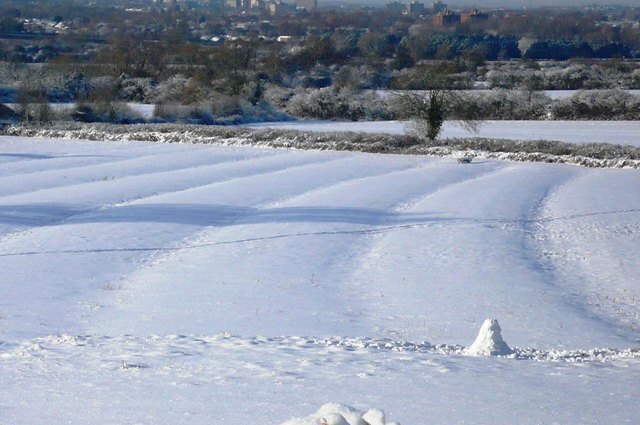 Ridge and furrow left by medieval ploughing can still be seen in the field alongside the school. Other common fields bordered Ham Road and ridge and furrow is still visible here too. A series of Enclosure Acts from the 17th century onwards consolidated strips into farms and this squeezed out smaller land holders who became farm labourers working on the larger farms. Although ownership of land changed over the centuries through events such as Civil War and the Dissolution of the Monasteries, daily life changed little for the villagers. They continued to work on the land, or in industries which supported the farming community, until the mid- 20th century. 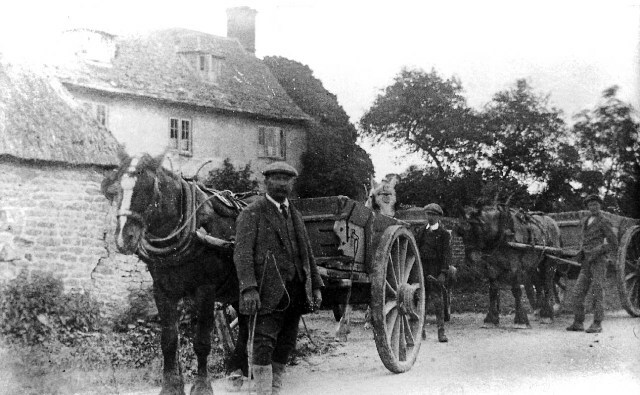 Wanborough was a mixed agricultural area - cereal and other crops, dairy, sheep and pigs, and had its local industries to support the farming economy. Wanborough had a watermill on the Lidd near the moated site on the Marsh to process cereals, a rope makers using hemp grown on the downs, weavers, a butcher with slaughter house which backed onto the village pound, and several farms bottled and sold their own milk, and made cheese. 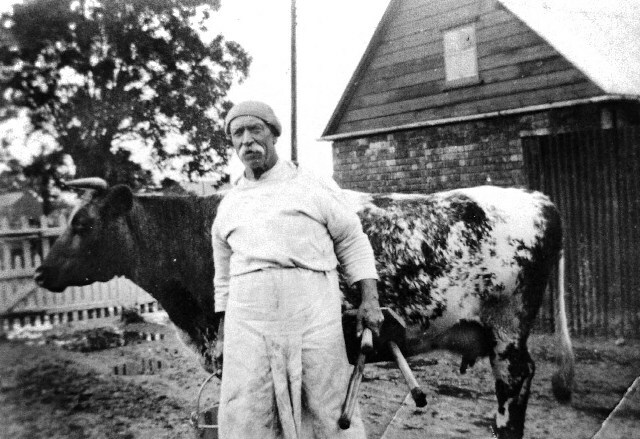 Blacksmiths, a wheel wright, carters, carpenters and a thatcher provided other necessary services to the farming community. 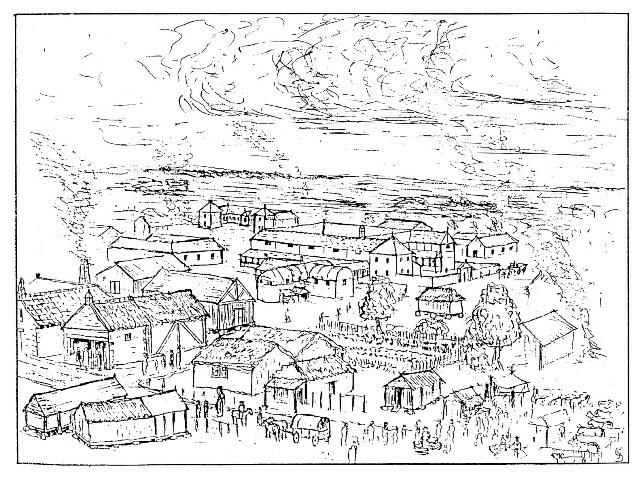 The village was self-sufficient in providing the necessities of daily life. As well as the butcher mentioned above there were two bakers, three shops, a shoemaker, a basket weaver at Magdalen Cottage, and a candle and soap maker at Court Close. 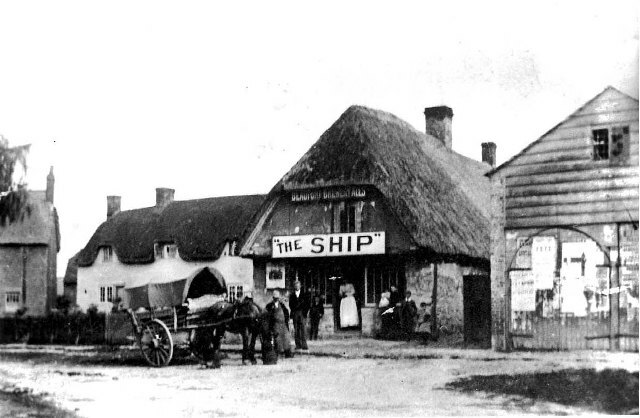 As now, the village was always well supplied with inns and alehouses, and had its own brewery next to the Harrow, the site now occupied by the Maltings. The earliest surviving records of Wanborough's alehouses are in Quarter Session records for 1579, when three licences were renewed. The alehouse keepers are named but not the premises. The earliest named inn is The Crown mentioned in the manor court rolls of the 1690s. It closed in the 1780s and was bought by the parish to become the workhouse, possibly what we now know as Tally Ho Cottage. 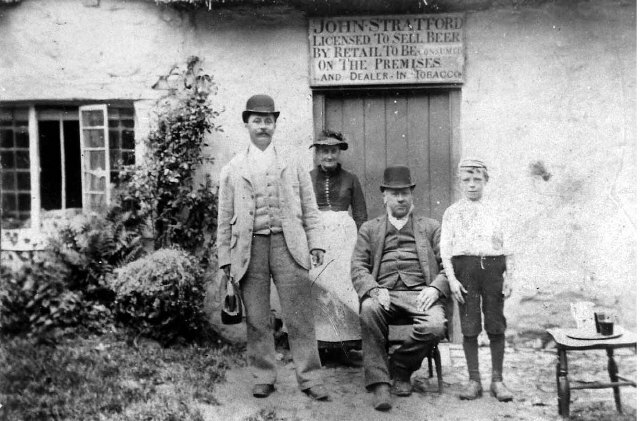 In the late 19th and early 20th century the village also had several beer-houses supplying ale, but nothing stronger. These were closed by the Balfour Act in 1905. The Ship formerly the rope makers and later a shop. The Axe and Compass at Shears Farm. Wanborough was well supplied with inns but tradition has it that it also had many churches - up to 32!! I know of only seven - St Andrew's, St Katherine's mentioned above, St Ambrose's serving Hall Place and hence Ambrose Cottages in the High Street, possibly one in an upper room at Callas House reported by William Morris. One would expect there to have been one at Earlscourt but I have found no mention of it. 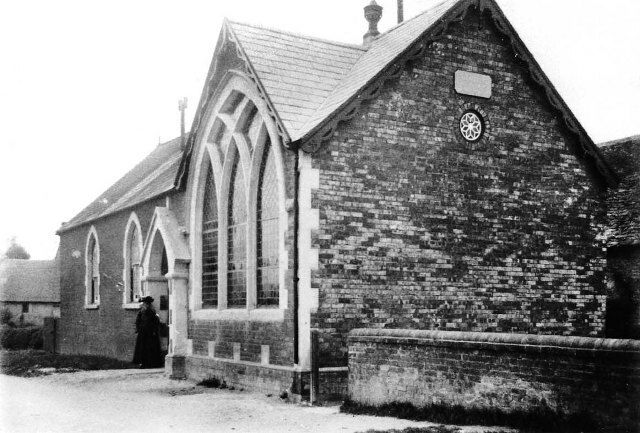 Finally there were two non-conformist chapel, one in Rotten Row now demolished and the other in Chapel Lane now a private house. With shops looking after the physical well-being of villagers and churches the spiritual that only left the mind. The old school was next to the church and early school logbooks show that many children were absent at harvest time because their help was needed with harvesting. 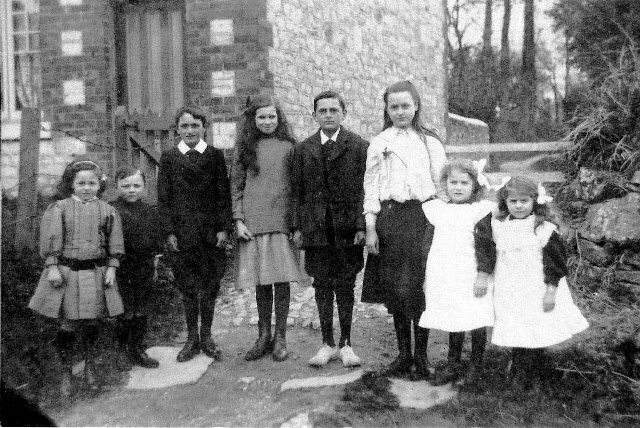 The more prosperous in the village sent their children to a private Dame School which for a time operated from Dolphin Cottages. 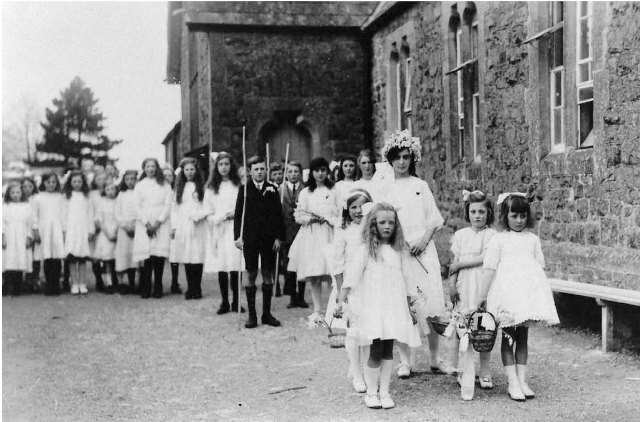 The old school held its centenary celebrations in 1981 and moved to new premises in The Beanlands in 1991. Until the second half of the 20th century most people who lived in the village worked here or for GWR in Swindon. Since then new roads and improved transport together with mechanisation of farming reducing the need for farm labourers changed the nature of the village. Demand for housing by people moving into the area to work in new industries in Swindon or commuting daily to London or other towns has resulted in rapid expansion of the village.